Home \ CCIE \ I passed the CCIE Lab Exam! I passed the CCIE Lab Exam! Well the post that I have been dreaming of writing since the start of this blog is actually being written. It has been a journey and as readers of this blog will know it is not my first or second attempt, but I have got there in the end. Previous to my first attempt I had used INE materials and attended two bootcamps. My second attempt was at the mobile lab in London and due to many factors apart from being not on top of troubleshooting again and running out of time was a really bad nights sleep. Do not underestimate this – it can really ruin your day. I then made one more attempt at V4 and managed to get a very rare seat days before the version change hoping to nail it but again this time I had L2 issues and then ran out of time in the config with no time to verify. So I then moved onto version 5 – I was not going to jump straight in as I had some new technologies to learn, mainly DMVPN. I also had to really work on my config strategy which I had spent a lot of time on, the main strategy to this is to not do the configuration in the order of questions presented to you, spend some time at the beginning of the lab going through all the questions and grouping together some common configuration tasks relating to groups of devices. This is a much more efficient way of approaching the configuration section and by putting all your config in notepad first before pasting into the devices you can visually check it for minor errors. Using this approach gave me the time I needed in my passing attempt to verify everything and you would be surprised how many small errors and missed config you pick up, I would say that on my verification run I probably picked up about 8 points which is the difference between passing and failing. So finally in August 2015 I passed the lab exam and am now looking forward to my next challenge. I will continue with the blog but the topics will be more varied now and not purely focussed on CCIE related material. 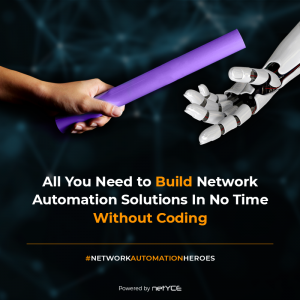 Want to learn more about Network Automation? Network Automation skills are becoming a must for network engineers of the future. Get started and learn the skills you need for the future with my course on Ansible for Network Engineers Today! 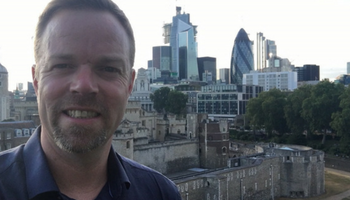 Roger Perkin - CCIE #50038 is a Network Automation Engineer & CCIE Consultant based in the UK, currently working for Softcat Plc as a Senior Network & Security Consultant. Please see my comments above as most people are asking the same questions. There is no shortcut – just learn the technologies. Learn how BGP works, learn how DMVPN works, learn how OSPF works and make sure you can configure every feature. Once you understand how things work, the configuration is easy. Congrats Rogers, what is the best study method for people as like me are starting with the CCIE Journey? First of all congress to you for this happy moment.. I am alsoo trying for R&S V5 lab. I need your help & suggession on this. Can you help me here please. how should i start my preparation. You need 3 things to pass the CCIE lab exam, time, money and an understanding family. If you have all those in place then focus on learning the technologies, if you can use a training vendor I used http://www.ine.com then once you have mastered all the technology you then need to start focussing on your exam techniqe, take some full scale mock labs and see you you do, you need to good on all technology as the troubleshooting section will find any weaknesses and you will be stuck. Then prepare financially to have at least 2 attempts ready, that way if you fail, you can go back again in 30 days. I made this mistake and did not have the funds to go back for another attempt and then let my studies slip for 8 months. Better still if you can get your employer to pay. Finally the family, if they are understanding of your study time and the reason you want to be a CCIE then great, it will be a long journey but the key is to not give up. Once again, congrats for the your achievement. – Do you first type all configs in a notepad file then paste it? – Do you type the configs for the full exam or work by section? – What is your strategy when you paste the config in the wrong routers? the notepad method works when you have to put the same config on many routers, it does not make sense to type a config into notepad that you are only going to put onto one router. You will soon work out which config you would do directly onto the router and which makes sense to do in notepad. BGP is a perfect example where there is a lot of config but only minor differences between router configs. If you paste it into the wrong router just remove the config or reload the router and paste back again into the right router as you have all the config ready. It is all a personal preference, some people prefer to just type into the routers others like to have the config in notepad. Just do what works best for you. Well done, you deserve your number, you worked really hard for it. I’d like to say thank you for the technology related posts, these helped a lot to other fellow crazy people who’re doing the same thing! Ps. Your Brussels video was very good, helps to have an idea what to expect on The Day! Thanks, and good luck for the 13th. If you can get as many days off work as you can before the lab and devote as much time as you can to pure cli time. Ideally get away for a few days and if you can get to Brussels 1 or 2 days early even better. Congratulations Roger, I’ve come across your blog a few times and read about your setbacks. You got there in the end. I am also just starting this journey. I’ve purchased my INE access and lab tokens, but am struggling to come up with a study plan. I’ve seen Brian McGahan’s prep videos and am keen to follow his model, but I’m still a little unsure of how to structure the whole thing. Any tips? The only advice I can give is do what works best for you, go through the blueprint and see what areas you are weak on. What do you not have a clue how to configure and what do you do every day at work. Go through the workbooks / videos to get an understanding of a topic and then lab it to death! Make up your own labs. It will take a while but one day it all clicks into place and realise you know how everything works together. If you are just starting it may seem daunting but just start to learn something, pick a topic watch the videos and do the workbook. It took me many years to get there, if you are dedicated and are a good CCNP level you could do it in 6 months. The thing with CCIE is there is no golden rule – its different for everyone, work at your own pace and then when you feel ready dedicate every minute you can to it. Congratulations Rodger your a real inspiration. I am about embark on my CCIE journey, I wanted some advise on hardware for the lab. What did you use for your studies and practice and any tips would be appreciated. I used the INE rack rentals, my own CSR1000V lab based on the INE topology – details here https://www.rogerperkin.co.uk/ccie/ccie-version-5/ccie-virtual-rack-csr-1000v-routers/ and GNS3 a lot. There are no secrets, you just need to get your head down and learn the technologies any way that works for you. Happy to hear that news, Well done and big Congratulations!!!! Well done mate … You done amazing job…. Finally you get it!!! Congratulations!!! I’m going in this blog very often to see if you finally BEAT the monster LAB!! And at the end you will!!! I’m currently CCNP and I am preparing for the written EXAM. I’ve two questions Roger: First your reading book list and second I want to know if from your point of view without experience on the real network world (a job on networking) the lab and the written of course is possible to pass. Also you ask can you pass the CCIE Lab Exam without any netowrking experience? That is a very subjective question as technically the answer is yes because the Lab exam does not actually test real world network scenarios where experience would help. If you understand all the technology and can configure it then you can pass the exam. However without experience you have no appreciation of a large network and how things interoperate and when you do pass you are a CCIE with no experience which does not really help you in the job front. My suggestion is to not rush it and get some experience while studying for the exam. Thanks for your answers and good luck for your future projects!! Roger, have followed your attempts – congratulations on finally attaining your CCIE. Well done sir, from a fellow CCIE. Thanks a lot – as they always say it is a journey! Thanks Rune, It was a long time from the bootcamp! But I was not giving up. Congrats and well done buddy! When doing my practise labs i have been using the config replace method quite a bit without any issues on GNS/IOU. I was told by an instructor not to use this in the real exam as it is quite buggy. Did you use config replace for multiple copies of the configuration at different stages in case you needed to rollback or would you recommend against it? You deserve this.. I’ve been using your blog as a learning tool.. Just took and Pass CCNP Route last two months and i can say your blog help me a lot. Thanks Nidz, that means a lot and well done on passing CCNP Route – CCIE next? Congratulation, you deserve it. I was waiting for you to post this ! Hard work and perseverance always pay. Enjoy your number, take some time with your family and then you will be ready to climb another mountain. I like your site as well! Congrats on getting your number!!! It may be a late congratulations but very well done. I remember when you said you had the 1st attempt scheduled. I had my first attempt on the same day as you in 2013 in the United States and failed as well. I ended up cracking it on the 2nd go around. CONGRATS again!!! I am now freshening up the new topics as I have to re-cert in a couple of months. Thanks Robert, it has taken me a few more attempts but I have finally got there, and looking back have learnt a lot! As they say its about the journey. Now looking forward to learning new technologies, maybe another CCIE or even CCDE! Congratulations Roger on your achievement!! This is quite late but congrats Roger. Your persistence and dedication paid off. As of this writing Im still on the CCIE journey. Started 2012 but I went hot and cold along the way. I was luckily included to be a part of our company’s ccie360 program last january 2016 so my dream to be a CCIE was resuscitated. I hope to finally get that ccie number and this blog site is really helpful especially at times when I go out of track . 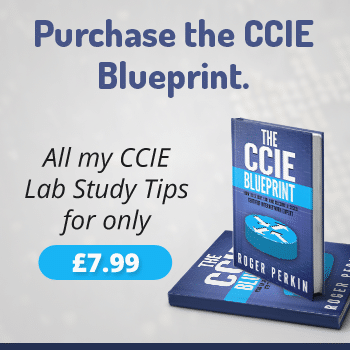 Is CCIE still worth it in 2019? 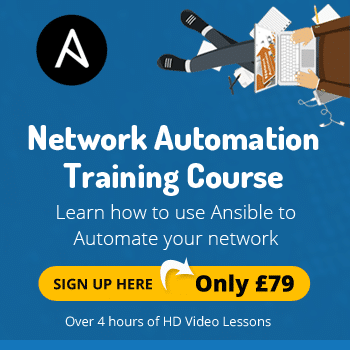 Looking for Ansible Network Automation Training? 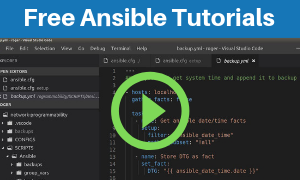 Learn how to install Ansible, write your first playbook and start automating your network today. Roger Perkin, (CCIE #50038) is a Senior Network & Security Consultant. Currently working for Softcat plc. Roger is an evangelist for Network Automation and is continuing to develop skills in Ansible and the Devops culture.